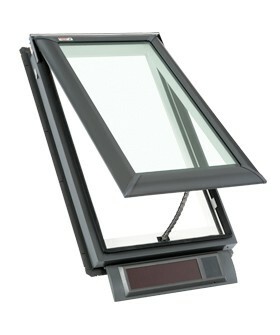 Rough opening measures 30 1/16" X 54 7/16"
VSS M08 - Fresh Air Solar Powered Deck Mount Skylight - Shipping Included! The VSS skylight comes with pre-finished white frames and sashes that eliminate the need for secondary high cost trips by a painter. An insect screen, a stainless steel chain operator and aluminum cladding are also standard with all VSS models. Smooth, low-profile does not obstruct your roofline. Solar panel elevated off the roof deck to allow shedding of roof debris. 30 1/16" x 54 7/16"